We’ve been talking a lot over the last couple of weeks about how Clear’s Internal Push Hands can build internal power, offering testimonials from our students and investigative pieces on different aspects that the system addresses. But, the clearest indication of the power of internal push hands are the results of our students, and today we’re going to spotlight a three time push hands gold medalist and student, Ronin Kai. I had the opportunity to interview Kai about his experience and success in two tournaments he competed in in 2014-2015. Kai currently lives in Houston, TX, where he enjoys the vegetarian cusine and the diverse martial arts the area has to offer. He’s a practitioner and instructor in several disciplines, including Meditation, Yoga Neijia (Xing-yi, Bagua, Taiji), Escrima and Pencak Silat. In addition, he is also a certified Clear’s Tai Chi instructor. 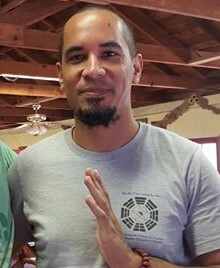 With his width berth of disciplines, exemplary commitment to the community, and teaching duties one wouldn’t think Kai would have time to compete, but he managed to enter into two different push hands tournaments to test the skills he learned from his participation in Clear’s Internal Push Hands Workshop and Certification Camp. He specifically wanted to test the internal skills he had learned in a non-compliant environment, against more experienced push hands practitioners. Kai’s hard work paid off. During his competition he earned 3 gold medals in Push Hands in two different tournaments from 2014 to 2015. In his matches he went up against practitioners who had twice as much experience in the arts. Despite the gap in experience, he managed to succeed utilizing the internal skills of Clear’s Internal Push Hands. The two skills I would attribute to my wins were Sensitivity (Ting Jin) and Sung (dynamic relaxation) from the Internal Arts. With both of these skills combined it was easier for me to auto correct my posture and detect weaknesses in my partner’s own structure. Of course when my partner would use increase force I would have to be able to redirect his momentum and still be able to execute my moves under duress. In one of the semi-final matches my partner would continue to tense his chest every time I got him. He started getting angry, wouldn’t look me in the eyes and it felt like he had a rock in his chest. With the Internal Push hands sensitivity training I was able to pinpoint this area and wrap around it, once that had happened I had complete control of his mass. It was definitely an eye opener seeing me bounce him around no matter how hard he pushed. The final round for Gold Medal proved to be even more of a learning experience for me. As soon as [my partner and I] touched hands his whole body was tense. He came straight out of the gate blasting with brute force. The tendency to respond with force is always there but keeping calm and relaxed really helped me hold my ground. After few points scored on his side, I had tuned into his structure and began redirecting his force against him. His eyes would become wide as saucers as I bounced him to the floor several times. My sensitivity and technique was so ghost like he didn’t have any idea what I had done to him and it made him even more perplexed. This match really sunk in the Sung aspect of our training and whole body breathing. After 3 rounds to get to the finals my partner was breathing heavily and I was still relaxed. It’s a reminder to let the breath travel freely in the body and the more relaxed you are the more efficient the breath becomes. This is where the healing aspect shines in these arts and continue to unravel with a lifetime of experience. Wow. You can see from Kai’s story that the internal principles developed by internal push hands can be directly applied to beat aggressive and more experienced opponents. You can check out Kai’s finals match at the 2014 International Chinese Martial Arts Championship below. Kai is the gentleman on the left in the video. These videos were uploaded by his opponent, Javier Rodriguez, a 10 year+ vet of Push Hands. You can see Kai applying internal skill in the video to redirect and anticipate his opponent. Really impressive. Clear’s Internal Push Hands has had three different students go on to win gold or silver medals at push hands tournaments. All without ever competing in push hands before. With stories like this, it’s easy to see that internal push hands equals results. If you want to build internal skills with push hands, be sure to check out Clear’s Internal Push Hands Instructor Course DVD Package, which features all of the techniques and skills covered at the Internal Push Hands Workshop. You can still get the entire package for $100 off with our launch sale. But you better hurry, because the sale ends today.